Back in February, we announced General Availability of Power BI enterprise gateway, which enabled centralized and IT-managed access to on-premises data sources. Since then, we have continued to improve on the initial release, and have added numerous data sources and connectivity choices to on-premises systems. To reflect the expanded capabilities, the Power BI enterprise gateway will be referred to as On-premises data gateway going forward. You can download the On-premises data gateway. The data gateway can be deployed centrally and allows you to manage data connections for multiple cloud apps so you need to install only one gateway to enable cloud to on-premises data connections. 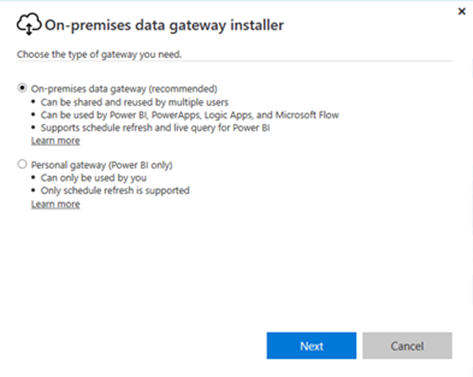 Once the gateway is installed, it is available in all supported apps and can be used to set up multiple on-premises data connections. The On-premises data gateway offers feature parity with the existing Power BI gateway for enterprise use and we plan to continue to add additional capabilities to make it easier for IT administrators to manage and control on-premises data connectivity. The existing on-premises data connections will continue to work within Power BI. 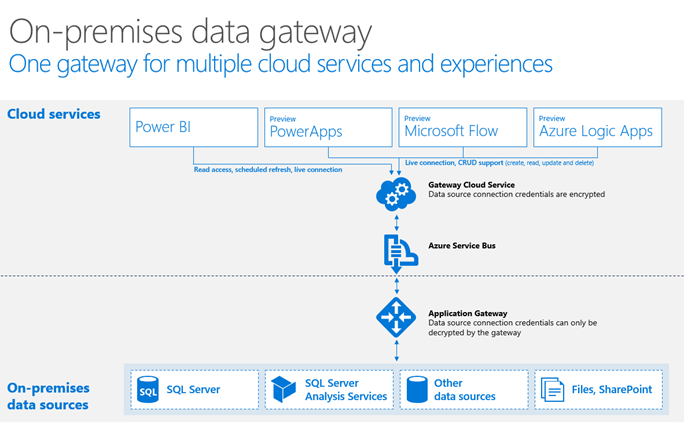 The On-premises data gateway replaces the Power BI gateway for enterprise use (Enterprise gateway). With this month’s release you can upgrade your existing installation to the on-premises data gateway, giving you the ability to connect PowerApps, Microsoft Flow and Azure Logic Apps to on-premises data sources (in addition to Power BI). What does this mean for Personal gateway users? The Power BI personal gateway will continue to work and can only be used to create on-premises data connectivity for Power BI. With the release of the data gateway we combined both gateway installation experiences into one single installation file. During the installation process you can select which gateway you’d like to install. We’re very excited about this change, and look forward to hearing from you. Please feel free to send us your questions or feedback directly to hybridbi@microsoft.com and join the conversation at the Power BI Community.